In my previous post: "Tickling China (and gauging it's heat)", I talked about some stunning facts about their GDP, artificial growth and unimaginable infrastructural investments. In this article I intend to focus on their infrastructure growth and why that (the most celebrated face of their growth story) could result in their downfall. -- As I mentioned earlier, 95% of their growth last year came from fixed asset investments! On an average fixed investments have contributed to 40 to 45% of their GDP in the last 5 years. Thomson Reuters's research shows this is much higher than what Japan (85-91: 32%) and US (01-06: 17%) experienced during their Real Estate Bubbles. -- Empty buildings are becoming a common sight in major cities now. This is not normal for a developing country. The official vacancy rate in Beijing capital is 30% but touches 50% in a lot of pockets. -- Even with the rising vacancy rate, the rentals don't seem to go down. The reason is a little crooked: lowering the rental would mean lowering the value of the underlying land, which in turn is used as a collateral on another loan for current development work. So rentals seem to hold their ground. Oh yeah, this looks similar to a chapter from the classic Madoff or Ponzi book. 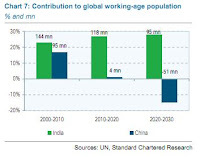 The One child policy introduced 32 years ago might have been necessary but it also means that their population will age at a faster rate than normal. 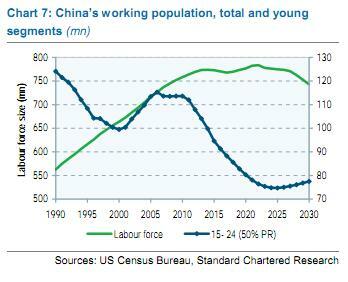 Their working population is set to decline from 2010 onwards. In 10-15 years the population pyramid could look similar to Japan's. By 2050, India will have the highest working population. 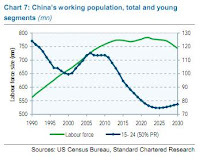 "China could have a ageing problem similar to Japan before it gets as rich as Japan"
= Vacant cities (homes/offices) + increasingly fewer people who can afford to pay for the infrastructure/ homes/offices/rentals..
+ highly probable real estate bubble-burst (more like a bomb-explode). Click here for a photo blog. There are lot of other cities that run a shockingly high vacancy rate. A simple Google search will get you to more information and pictures. Here are some more interesting pictures. I hope I am wrong about China, because there are a lot of countries that could be dragged into the hole. I happen to work in one of them - Canada.